The detachable cafeteria tray used on the Bean Bag Dinner Tray gives you spill insurance. The generous one inch deep rim around the tray ensures no spills on the furniture even if your drink is tipped over. The bean bag is filled with lightweight polyurethane beads which give a "soft pillow-like" comfort feel as the bag molds to the curves of the tops of your legs. The bag fabric is woven with 65% Polyester and 35% cotton threads. The bean bags are made from a variety of print fabrics - let us choose one for you, or call if you would like a description of what is currently available. 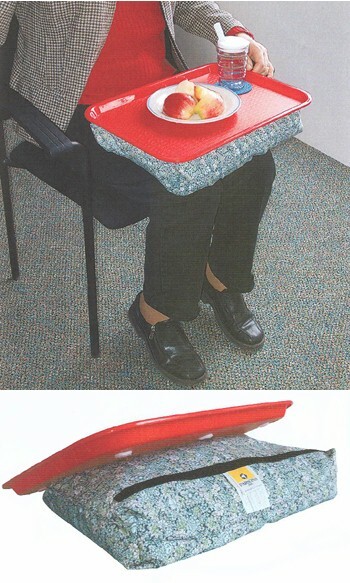 The greatest benefit is the detachability of the plastic dinner tray from the bean bag. The tray is secured with "hook and loop" closures and can be peeled off for washing and reattached in seconds. The red color of the dinner tray is an added benefit for those with low vision or Alzheimer's. 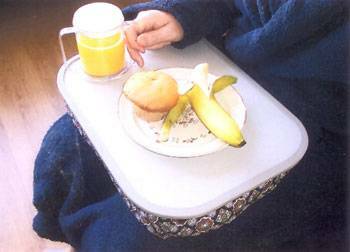 Studies have shown that Alzheimer's patients eat more when their meals are served on red dishes. This would make a great gift for someone who enjoys eating in front of the television. The tray measures 12" x 16."